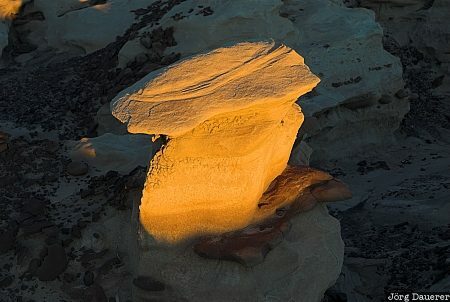 A hoodoo in Bisti Wilderness illuminated by the last light of the day. Bisti Wilderness is in the south-west corner of New Mexico in the west of the United States. This photo was taken in the evening of a sunny day in October of 2006. This photo was taken with a digital camera.